Let's be honest: there are drawbacks to every school in existence. Whether it's the location, job opportunities, curriculum, staff, facilities--everything can't be perfect. So when you visit schools, make sure you ask students not only what their favorite things are but also their least favorite things. If there's a home football game, do NOT try navigating Charlottesville near game time. It's a mess. Friday afternoons can be bad, too. Oh, and parking? It's scarce and often costly. Personally, unless there's a pressing reason, I don't understand why students bring their own cars. The convenience just doesn't seem to justify the price. The bus system is incredible! Between the trolley, city buses, and university buses, you can travel from Alderman Library to the Downtown Mall to the hospital to Hereford Residential College to the Law school for free. There is absolutely no charge for anyone to use university buses. Furthermore, the city is so beautiful and compact, I walk everywhere: to the shopping center, the Downtown Mall, the Corner. They're close together, and unless it's raining, the walk is scenic and enjoyable. Oh, computers. They're wonderful and yet the cause of so many meltdowns all at once. The Student Information System (SIS) is a new version of the Course Offering Directory (COD), and I can list many things I'm more fond of than it. True, part of the dislike is that it's a change from the old system, but there is also the fact that course listings are now more confusing because every course is listed, not just the courses for a given semester. Also, the SIS doesn't allow testing periods to overlap, meaning lots of paperwork to override the system. It's a headache, and it's obnoxious, but we keep it around anyway. The SIS allows you to list every class you want to enroll in and then when the time comes to enroll, click a single button and you're into each course. With the COD, you had to wait to get the list started and so people with 7:20 AM appointment times often complained of being too tired to sign up. Once I had a very early enrolling appointment, and I can vouch that trying to use the COD and correctly get each class when I'm that groggy is only asking for me to make a typo and end up in the wrong class. So that's a major improvement. Also, I did like seeing every course being offered when I had to plan out my major. Having every course just made the process simpler because I had the complete Record in front of me. And no matter how much the computer system upsets some students, they can usually just course action into whatever class they want. Course Actions override SIS restrictions and credit limits. They're an excellent ace in the hole to have when a class closes due to enrollment being filled. Of course, every professor can't always course action everybody, but chances are good that if you really want to be in the course, the professor will let you into it. One of the cool things about UVa is the unique experiences you get to have in the classroom. It is interesting to see the different ways professors teach material and try to help us prepare for our future careers. As a first year engineering student you are required to take Sociotechnical Systems, better known as STS. The course is unique to UVa and is designed to help future engineers better understand the effects that technology has on society and life. They need to understand how their decisions could affect the world. One of the staples of this class is a class session called “Katrina Sim.” Katrina Sim takes place over two days, a normal hour and fifteen minute class period, and then a large 6:30pm to 11pm session later that week. It can definitely be classified as a memorable experience. As you and your fellow engineering first years flock into Clark Hall you can feel all the different emotions mixing together, no one really knows what to expect. Ten minutes later it’s a frenzy! The Department of Homeland Security is telling FEMA they need to get levees built, some environmental agency needs shelters, and the mayor’s office tells everyone there is another storm on the way. The whole event is done using a computer program that allows the different groups to link together and send emails, exchange money, and build and design technology to help reform the city. At the end of the simulation everyone just wants to go home and go to sleep, but we all realized that we have had valuable experience of what we may expect once we enter our careers. We learn how to manage demands from multiple companies and still get things done that benefit our own cause. Katrina Sim is just one example of cool ways that professors teach their curricula. Look around when picking your classes and see what interesting things you can find. Or if you have a good idea feel free to email your professor, you never know what they may be interested in implementing into their course. UVa is a great place to be if you enjoy learning in new, different, and interesting ways. The other day, a friend in high school asked me about applying to college, how many I applied to, why I chose UVa, etc. I am a second year, I applied to colleges almost two years ago; so I do not remember every application essay I wrote, but I do remember why I decided to come to UVa. I am reminded every day why I go here - the people. Yes UVa is a top notch school, yes I will get a great education here, but it really boils down to the people. If I didn't like the people I would be miserable, because college is not just about extending your factual knowledge. It is also about meeting new people, learning about different cultures from those people, learning from those people in general. Do not get me wrong, the academic aspect of college is very important; it is just easier to live in an area for four years of your life if you like the people you're surrounded by. I have met so many new and different people since I have been here. People I would never have met under any other circumstances. The other day, I got lunch with a friend of mine who is from Taiwan; and I learned more from him about Taiwan than I ever have. There is a difference between reading a book about a country and talking to a person from that country. Last week, the LGBT (Lesbian, Gay, Bisexual and Transgender) Resource Center sponsored its semi-annual "Proud to Be Out Week." The theme of the week was Love out Loud and different student groups from around the University held events celebrating LGBT life at UVa and encouraging students to be honest and proud of who they love. Events for the week ranged from a panel of students sharing coming out stories in the Dome Room of the Rotunda, to movie screenings and discussions to the highly-anticipated Drag Bingo party on Friday night. QSU (Queer Student Union): A highly social organization, QSU is open to students from across the University, regardless of sexual orientation. Each meeting focuses on an issue pertaining to the LGBT community and gives students a chance to meet one another and discuss topics like gay marriage, adoption or transsexuality. QUAA (Queer and Allied Activism): While QUAA fosters a social environment similar to QSU, its main focus is rooted in activism. I've seen QUAA plan vigils around grounds, organize UVa's Day of Silence and travel to rallies and activisit events around the country. Sigma Omicron Rho: As UVa's first gender-neutral queer and allied fraternity, Sigma Omicron Rho represents a giant leap forward for UVa's LGBT community. Founded this fall, the fraternity gives students a chance to find a smaller niche within what can feel like an overwhelming University community. Whether or not you plan to become involved with LGBT organizations at UVa, its so important to regonize the thriving community present here. The administration and student body are incredibly supportive of LGBT organizations and I feel so thankful to have spent time at such a tolerant and understanding University. As always, feel free to shoot me an email with any questions! In hopes of not looking too much like a copycat, I’m going to continue with Nicolas’ discussion of food because it is so UNBELIEVABLY good here in Charlottesville! Right now I’m sitting in the Fine Arts café, a delicious organic restaurant on Grounds, but that is ONLY the beginning. Last night, the Alumni Association hosted an event for all students called the Taste of Charlottesville [see below for my lackluster attempt at taking pictures]. 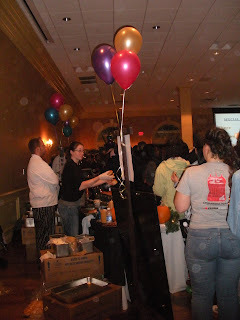 Restaurants from all over Charlottesville came to share their specialties with the free-meal minded student community. Although the lines were long, I was able to snag a small sandwich from Take It Away, a fajita from Baja Bean, cheesecake from the Melting Pot, and some bread pudding from a local French place. Yes, I know what you’re thinking…that’s a whole lot of food. While that may be true, free food must be consumed in abundance when you’re a college kid on a tight budget. Fortunately, the Alumni Association makes this relatively easy. They host various dining events such as Taste and First Year Food Fest throughout the year. Since most of the bloggers on this are upperclassmen, I don’t think anyone has talked yet about the dining halls/meal plans here on Grounds [which you are required to have as a first-year]. The food here is actually really good and there are so many options [I promise not saying this to sell UVa, I really do think the food here is great]. At any given time of the day you can choose from delicious stir-fry, chicken, steak, deli sandwiches, pizza, fresh salads, soups, and a plethora of desserts. A particular favorite of mine is the Saturday/Sunday brunch served at the Observatory Hill dining hall right by my dorm, Maupin. The food is unreal, especially the omelet bar and the multi-grain pancakes. I’m making myself hungry just thinking about it. Good thing tomorrow is Saturday! A few other random things I want to share for my post this month..
1. A. If you’re thinking about coming to visit, right now would be an excellent time. Grounds, until Thanksgiving, is really peaceful, a calm before the storm of finals I think. It’s also getting fairly cold and I think it’s good to come up and experience that if you’re from the South. I came up here during November of last year and that trip was very influential in my decision to come to UVa. 2. B. If you’re interested in either the Jefferson Scholars program [I believe that the application deadline for this year has passed already] or the Echols Scholars program, please feel free to email me if you have any questions (shelby.sutton@gmail.com). I’m involved with both programs and would be happy to dish out advice/answer questions for those of you interested. I’ll probably do a post on those programs in the coming months, as selection time grows nearer. 3. I hope all of you are having a wonderful start to the holiday season & that college apps (for those of you seniors) are finishing up nicely! Really, please email me if you have any questions. I was JUST in your shoes! Some are addicted to X-Box. Others are addicted to Gossip Girl. I am addicted to food. I went to Chipotle fourteen times last winter break (I'm actually wearing a Chipotle t-shirt as I type). I embrace my food addiction (clearly) and before coming to the University of Virginia I researched and taste tested Charlottesville’s most popular food establishments. I would be eating here for four years—1460 days—4380 meals; I had to be sure that there were fun food options. Researching Charlottesville cuisine was a delight and it took little time to realize that the city had some of the best restaurants in the country. 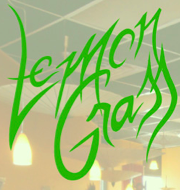 My taste test began at a Thai-Vietnamese restaurant on the Corner—Lemongrass—in the spring of my senior year. I can taste the Shrimp Pad See Ew as if it were yesterday. I went with a friend of mine who was a second year and I was pleased to discover that getting food was a common social activity for UVa students. I had always liked UVa but that was the moment I fell in love. My next stop was HotCakes, a bustling café located minutes from central grounds in the Barracks Road Shopping Center. I enjoyed a caprese sandwich on sourdough and a side sesame salad. It was well worth the $7.49 I paid and I became a HotCakes regular after my first bite. The café has free Wi-Fi so bring your computer and get a latte or two (or three!). The taste test didn't end there. I savored more food at College Inn, Bodo’s Bagels, Little John’s, Take it Away, and Miller’s. I explored Charlottesville cuisine before I was a first-year and I encourage you to do the same—even if you live in Alaska and it's via an online to-go menu! Food will be a huge part of your college experience. Luckily for you, the food in Charlottesville is incredible. If anyone wants to grab lunch, I'm your guy! If you're anything like I was in high school, being part of a sports team is really important to you. I'm sure you're struggling with the idea of choosing a huge D1 school where you won't have the comfort of a close knit team and practice every afternoon. But not at UVa, because we have tons of teams you can join! UVa has two levels of teams that are below the D1 level, club and intramural. Within the club teams, there's a variation of commitment and intensity. Some practice four times a week and travel most weekends, and some have a loose practice schedule and stay around grounds. With each team, your experience is really what you make it. I have loved my experiences so far with the Club Cross Country team and the Virginia Alpine Ski and Snowboard Team. We have practices for cross country every day of the week and for ski team two days a week, but for each team it's really when you have the time to come. We have fundraisers to raise money so that we can travel to meets and races, so it's a great way to hang out with your teammates outside of practice. 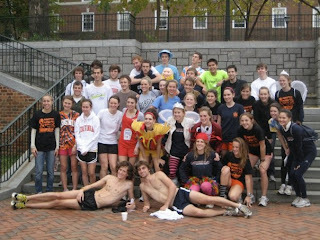 Through my club teams, I've met some awesome people and some of my closest friends at UVa. Another awesome way to get involved in sports is through all the intramural teams UVa offers. 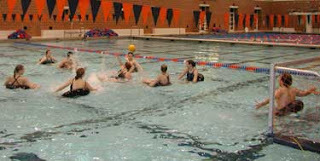 We have everything from inner tube water polo to soccer to racquetball. You can get together a group of friends and make a team, or you can sign up in the singles league and make some new friends! Either way, it's an awesome experience. Games are usually once a week, and they're really laid back. Some people sign up who played the sports in high school, and other people just sign up for the fun of playing. For example, I played on both a innertube water polo team and an outdoor soccer team this semester and I most definitely didn't play on either of those in high school. With the close of the fall semester about a month away and registration for new classes around the corner, I began to wonder about the variety of classes that I've taken at UVa. Coming in, I thought I would be sitting in a lecture hall, listening to the professor ramble while the students sat absorbing the information and taking notes. While I have taken some classes that have fit this perception, I have taken a surprising number of classes that have been quite different. For example, take my EDLF 5000: Multicultural Education class taught by Professor Bob Covert. Even though I'm in the College of Arts and Sciences, I was able to sign up for this class which is taught under the Curry School of Education. 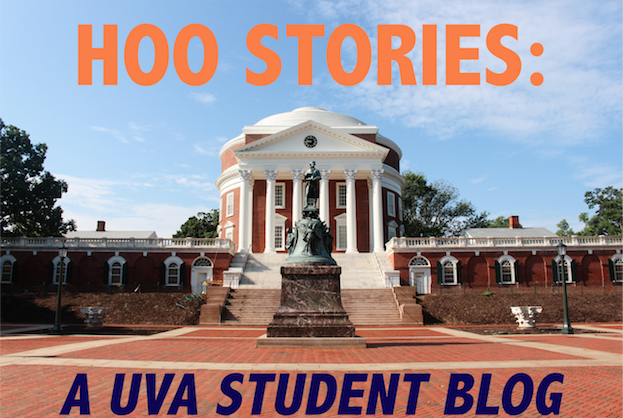 This is common among UVa's undergraduate schools--there are many classes open to just about any major. I walked in the first day and immediately was given my first assignment: sit next to someone that you haven't met who looks different than you and start a conversation. Little did I know that this would be the same assignment each week! Another one of our semester long assignments is to try and remember everyone's name! There is no textbook for the class because multiculturalism is not found in a book: it is found in the people and culture that we interact with everyday. The class is very much discussion driven even though there are about 75 students in the class. The professor doesn't give presentations while students take notes: the professor challenges us to think critically by asking the questions and then students stand up to give the answers. After a lecture of about an hour, we break into smaller discussion groups which are facilitated by undergrad's who took the class the previous semester. In small group, we delve further into what we explored during lecture and recount personal stories to see how the topics apply to our lives. It doesn't hurt that we bring snacks as well. Topics that we have covered in the class include racism, sexism, ableism, sexuality, education, prejudice, and culture. And yes...we do actually do work, writing reflection papers once a week about what we took away from class and writing papers on how our own experiences have shaped who we are today. In my opinion, the most meaningful assignment is a mandatory requirement to do at least 12 hours of community service, preferably with children. The point is to take what we have learned in class and see how it plays out in the community. This class will surely be one that I will remember many years down the road. Classes like this are one reason why I'm loving my experience at UVa.